Reuben volunteers with his owner Rita Burnett at Kootenai Health. 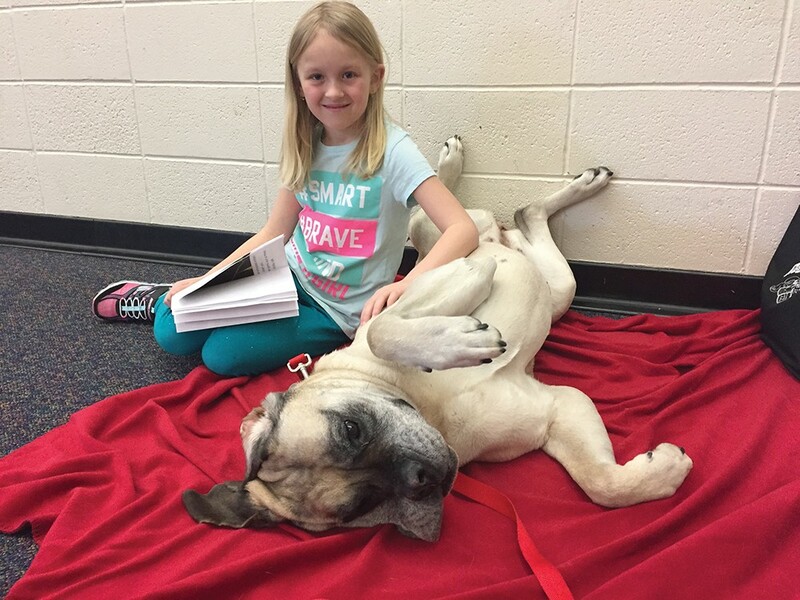 Linda Irish had been breeding Old English Mastiffs for several decades when she hit upon a novel way to connect with her Sheridan Elementary students. With her principal's permission, she brought a 6-month-old brindled mastiff pup named Macie into the classroom, tapping into the mysteries and magic of the human-animal bond. One story was particularly memorable, says Irish, recalling a student on the autism spectrum who didn't engage with anyone or anything. When Irish brought Macie into the classroom, the dog made a beeline for the child, nuzzling and cuddling him, yet the boy remained shuttered. One day Irish noticed him petting Macie. Over time he engaged with the growing puppy, then his classmates, teachers and the school; the dog found a special way in. Dogs seem to sense who needs help most, says Irish, who has retired from teaching yet still volunteers with students, albeit now with dogs in tow. In addition to Shriners Hospital and the Ronald McDonald House, Irish visits Gonzaga University's Foley Library during finals week with her teams of Reading Rovers, as they are known. Consisting of trained volunteers and dogs, Reading Rovers are a hit with students who might be missing the family dog or just welcome the stress break from studying, says Theresa Kappus, Gonzaga's Distance Services Librarian. "It's really hard to determine whether dog intervention is helping empirically, in data," says Irish, "but you can see the behavior and attitude change." Ellee is ready for a belly rub during a Reading Rover session with Kayden at Windsor Elementary in Cheney. Cyndi Caniglia, a lecturer in special education at Gonzaga, knows firsthand the benefits of being around animals. Growing up, she didn't see her involvement with horses as therapy. "But now, looking back, I can tell you the emotional bond and the daily emotional outlet I had spending time with my horse helped me deal with challenges of teenage life in healthy ways. Horses brought great joy and fulfillment to my life, and a healthy way of coping with stress and familial dysfunction." 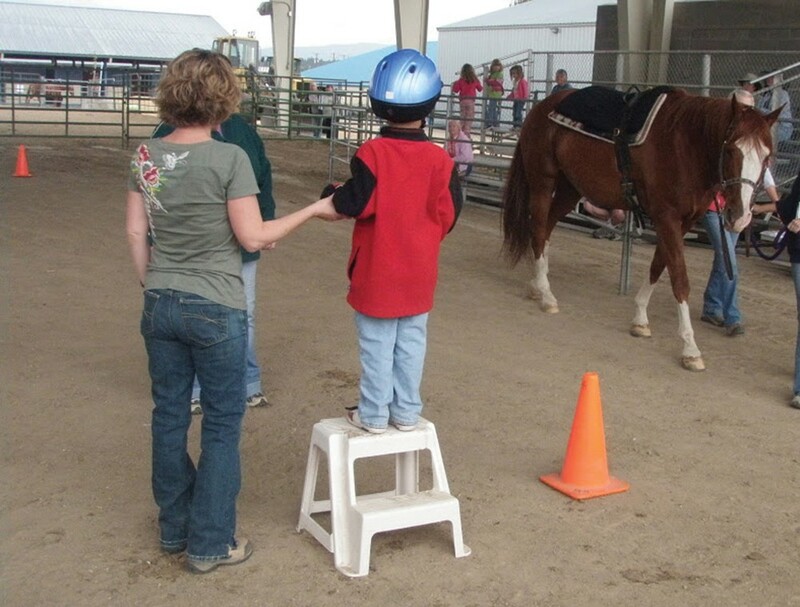 At Free Rein Therapeutic Riding, Caniglia is a riding instructor registered with PATH (Professional Association of Therapeutic Horsemanship International), a credentialing and advocacy organization that promotes equine-assisted therapies for people with special needs. Free Rein works with children and adults with disabilities — cerebral palsy, autism spectrum disorder, post-traumatic stress disorder — allowing them to experience a newfound mobility and freedom, gain confidence, and discover new avenues of engagement with their world. "I have witnessed volunteers and families shed tears of joy as they witness their child squeal with glee, as their horse trots and their team of a horse leader and side walkers cheer them on and laugh and giggle with them – a joy they may not experience anywhere else in their life," says Caniglia. Free Rein volunteer Cyndi Caniglia and a young rider wait for their horse. Equine therapy is one of several programs in Washington State University's studies of human-animal interactions (HAI), a program that dates back more than 50 years. The late Dr. Leo Bustad, former Dean Emeritus of the College of Veterinary Medicine, is recognized for his pioneering 1986 humane animal-care curriculum called "Learning and Living Together: Building the Human-Animal Bond." Bustad also helped form the Delta Society, which would eventually become Pet Partners, a 15,000-member national program focused on "improving human health through positive interactions with therapy animals," namely through advocacy and training. According to Natalie Pond, Pet Partners' Marketing & Strategic Partnerships Coordinator, there are roughly 100 human-animal partnerships registered in Eastern Washington and North Idaho alone. Pet Partners is the only organization to register multiple species: cats, equines, rabbits, guinea pigs, llamas and alpacas, birds, pigs, rats and dogs; the latter account for 90 percent of their interactions. Sophie, for example, is Marie Brumfield's irresistible 2-year-old English Springer Spaniel and registered Pet Partners dog. She illuminates the room when she visits Lakeland Village and Sacred Heart Medical Center, says Brumfield. "She totally 'works the room' from person to person," says Brumfield. "I just watch while my heart explodes." Sophie's impact on humans has a lot to do with chemistry. The Human Animal Bond Research Institute, a nonprofit partnership of several pet products corporations, has compiled reports showing that human-animal interactions (mostly focusing on dogs) can "influence levels of blood pressure, heart rate [and] hormones correlated with well-being, including cortisol, oxytocin, b-endorphin, prolactin, phenylacetic acid and dopamine." In other words, being around animals can make us feel better. In educational settings, that can mean decreased anxiety, improved academic performance, even enhanced social skills. At Pawsitive Works, the goal is to help at-risk youth learn "lifelong values of empathy, patience, self-concept, mindfulness, and communication while also improving the dog's adoptability." The program, which began in Bonners Ferry, Idaho and at Eagle Peak School at the Pratt Building in Spokane, builds on the importance of social, emotional learning, according to founding director Karen Schumacher. 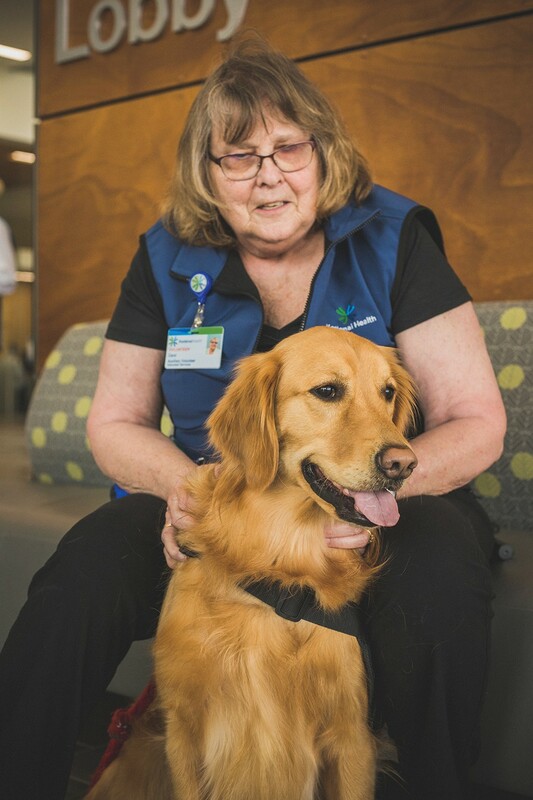 Health care providers have also embraced animals as partners in wellness, ranging from visiting patients at hospitals and assisted living facilities to working with first responders in crises. HOPE Animal-Assisted Crisis Response (AACR) is a five-region network of teams across 34 states that provide "comfort in the time of crisis," such as fire or flood, or in the aftermath of the unthinkable horror of a school shooting. Debbie Wing and her husband Chuck, members of HOPE AACR's Pacific Northwest chapter, responded to the October 2014 school shooting in Marysville, Washington. The couple also run LynnDee's Grooming & Dog Training Center in Spokane, which serves as a registration and testing center for Pet Partners. Wing, who has five dogs, two horses and a cat registered with Pet Partners, often brings her dogs to Spokane's drug and mental health courts, providing a welcome calming and humanizing effect for people on all sides of the judiciary system. For Vickie Sienknecht and her golden retriever Desi, offering help means trips to Hospice House. After a lengthy process for the dog — puppy kindergarten, good canine citizen training, successful trips to public places — and handler, the duo completed their Pet Partners registration at LynnDee's. With her gentle temperament and boundless energy, Desi is always a hit, says Sienknecht, who lost both parents in recent years. She's thankful to have shared Desi with so many, including health care providers, she says. "I feel like we're bringing it full circle. The people who have helped me, we get to bring it back to them." The desire to help others is a common thread among the 11 volunteer teams in Kootenai Health's pet therapy services program, as they cover daily shifts from 9 am to 11 am. 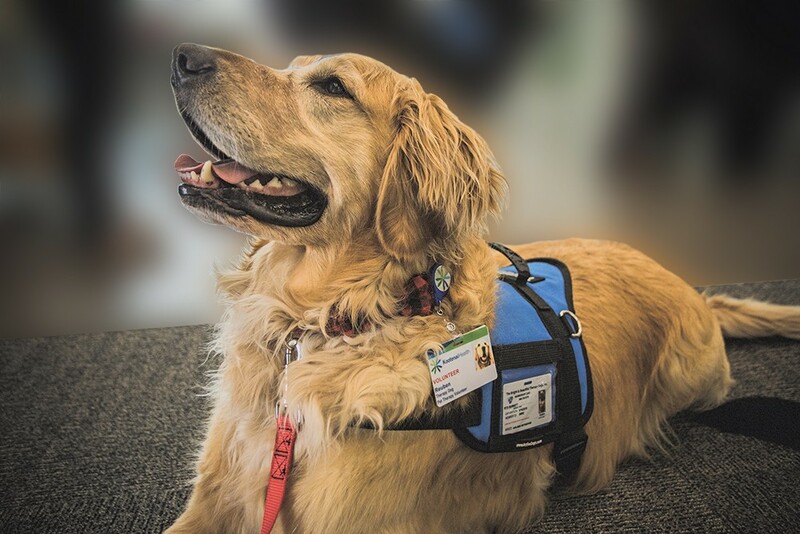 "Our pet therapy program offers patients and guests the opportunity to relax during a time that may be difficult or stressful," says volunteer services coordinator Shannie Davis. "Pet therapy is proven to help lower stress and anxiety, and having a caring, loving canine companion stop by for a visit offers a joyful distraction." 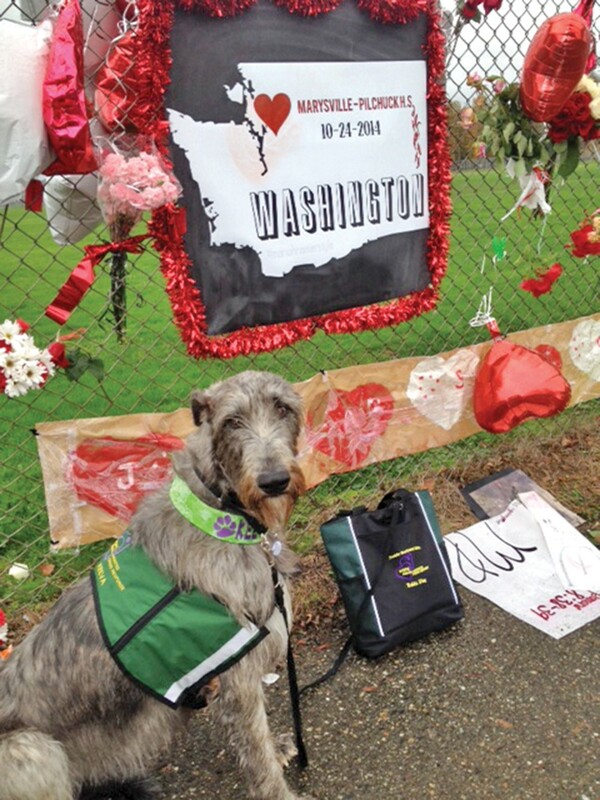 Debbie and Chuck Wing's Irish Wolfhound, Keeva, responded to the Marysville school shooting in 2014. "Sadie and I were visiting an extended care facility here in town when we were approached by a woman asking if I could bring her to visit her sister who had suffered a stroke," recounted Delaney. The woman hadn't communicated since the stroke, yet when Sadie laid her massive head on the bed near the woman's hand, to everyone's surprise and delight, the woman not only began stroking the dog, she looked purposefully at her sister and smiled. In addition to volunteering with her Newfoundland, Moose, staff pharmacist Kathy Widmyer is an evaluator for Bright and Beautiful, which vets all Kootenai Health dogs (some also belong to Pet Partners). What does Widmyer look for in a dog? "Disposition, and if they naturally like people," says Widmyer, who often brings Moose to the brain injury unit. Dogs have to be able to follow basic commands — sit, stay, down — as well as specialty ones, says Widmyer, such as avoidance when medication drops on the floor. She tests dogs around typical hospital equipment like wheelchairs and walkers. Crutches are a challenge, says Widmyer; to dogs, they look like weapons. Although they're less frequently employed in therapeutic settings, cats undergo the same rigorous vetting process, says Diana Roberts, who has registered three dogs and two cats with Pet Partners since 1996. Nyuchi, which means "honeybee" in Zimbabwe's Shona language, does hospice work, arriving in a crate and content to sit in patients' laps. Roberts also volunteers at Deaconess Hospital with her dogs and finds working the pediatrics unit emotionally difficult, yet rewarding. Carol Cook and her golden retriever, Molly, volunteer at Kootenai Health. Pet Partners, and organizations like it, have added a new dimension to our notion of animals in service, which is already rife with confusing and conflicting terminology. To be clear, "Under the ADA, a service animal is defined as a dog that has been individually trained to do work or perform tasks for an individual with a disability. The task(s) performed by the dog must be directly related to the person's disability." Therapy animals, in contrast, are not protected under ADA regulations. Also known as assistant animals, this group may include those providing comfort to a target audience, such as at a hospital, as well as those that are part of a recognized therapeutic treatment plan. The confusion concerns many involved in volunteering their animals to benefit others. Carol Cook figures she spends about 24 hours a month taking her golden retriever, Molly, to numerous assisted living homes and Kootenai Health. She worries that confusion over terminology may end up doing a disservice to legitimate dogs employed for specific tasks.